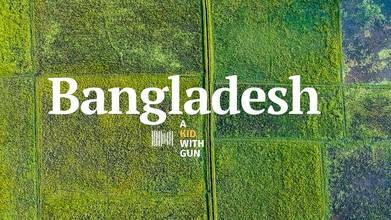 For a 60 second tour of the world's eighth largest country (as of 2018) you can't beat this aerial video of Bangladesh from native A kid with gun. The video opens with an epic bird's eye view of the great Buddhist monastery Somapura Mahavihara, in the District of Nagoan. Then it's on to rice fields, mangrove forests, a few the country's countless rivers, gorgeous white sand beaches, with some awesome shots of the country's capital city Dhaka, now one of the world's 5-6 largest cities.